Boston Handmade: Boston Handmade Downtown - Our Last Three Days in Downtown Crossing! Boston Handmade Downtown - Our Last Three Days in Downtown Crossing! Boston Handmade Downtown offers you a last chance to shop handmade this holiday season right in your own backyard at 505 Washington Street, in Boston's Downtown Crossing. The weather won't stop us! 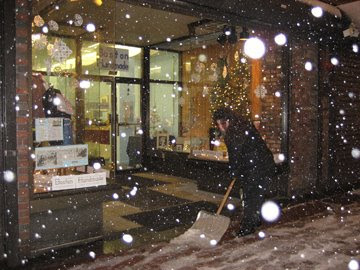 DeShawn took this pic of Jessica doing a little shoveling. Unique, handmade, one-of-a-kind and limited edition items await you! Now that you've given gifts to friends and loved ones, maybe it's time you give a gift to yourself. 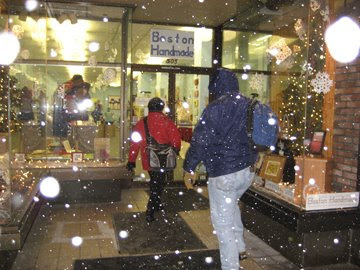 And by shopping at Boston Handmade Downtown you will be also supporting local businesses and the Boston arts community. 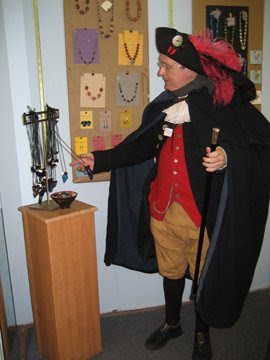 You never know who is going to stop by Boston Handmade Downtown, two weeks ago it was Boston Mayor Thomas M. Menino, the week before that we had a visit from Ravelry founders Jess and Casey, and last week we were visited by historic figure, Nathaniel Balch from The Freedom Trail Foundation - what a treat! There are still many wonders for you to take home like pendants by Nancyrosetta that are hand-sawed freehand out of sterling silver, and hand-painted "Walkies" by Bumble Belly Designs to hold all of your pet's leashes. 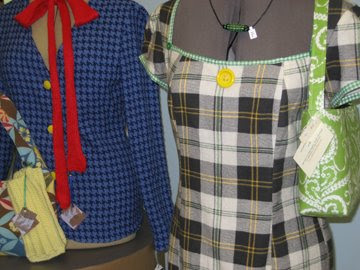 There's also women's and children's clothing created by Elizabeth Brennick Designs, accessories from Abba Dabba Bags, and so much more! Enjoy the rest of the holiday week and weekend by taking a trip Downtown to see holiday lights, skate at the Frog Pond, and check out Boston Handmade Downtown before we are gone for the season.